I was talking to a friend yesterday about how much Archie likes it when the swell is large and how he gets taken out to the back to catch long rides back towards the shore. I explained that sometimes I can just see him bobbing up and down in the distance with the coach; rising and falling with each wave. My friend asked me whether I ever worried about him when it’s rough; I said no because I trust the coaches who take him out. When you have a child with severe learning disabilities your whole life becomes about assessing risk. You visit a friend and rush upstairs to check the windows are shut and locked. You pick up small items because your teenager might swallow them, you triple lock your front door and the childlocks remain permanently activated in the car, long past childhood. You have to be constantly aware of where your child is, and who they are with. Not everyone can cope with supervising a severely learning disabled child because they underestimate the intensity of supervision required, which means that you often cannot take even five minutes out. You can’t stand and gossip with a friend if you don’t know exactly where your child is. It can make gatherings fairly pointless. Everyone else gathers and you wander around after your child away from everyone else. 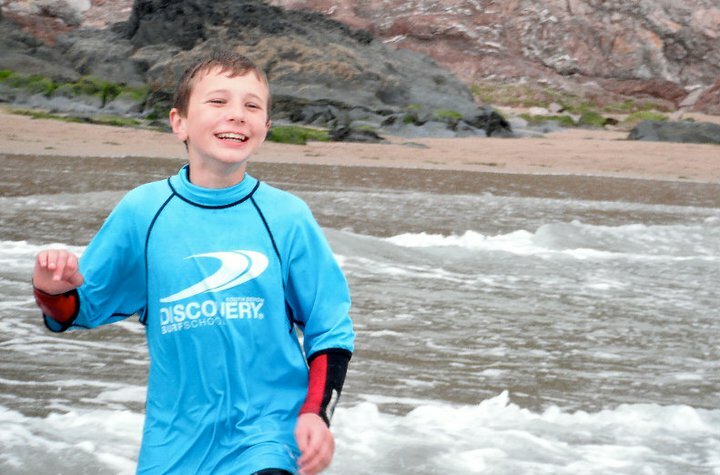 When children with autism or learning disabilities surf they typically stay close to shore and in depth. Buoyancy aids may also be worn. In Archie’s case he’s developed strong relationships with the coaches over the past couple of years and some of them now know him well enough to be able to take him further out or in heavier seas. For me, watching the independent relationships build between Archie and the coaches has been one of the most rewarding things about Archie learning to surf. Initially I used to make sure I was on hand, so that I was available if we had any problem behaviours. I was always nearby, I was his constant shadow. Now Archie has such strong relationships with the coaches that I just hand him over, they take him off to surf, while I have a bash at catching a few waves closer to shore. I don’t have to worry about where he is, or whether he is safe. Even in big heavy seas I can hand him over and know that for the next hour he will be doing his thing, and I can get on and do mine. I don’t have to supervise or intervene, I can leave him to it. Not having to worry I can switch off and lose myself in the sea for a bit. It’s proper respite for an hour. For both of us it’s a little hour of freedom. I don’t have to risk assess and monitor his every move and he doesn’t have to be pulled away from something potentially damaging every few minutes. The most dangerous part of any surf trip is probably getting changed in the car park particularly because Archie likes to run up to cars that start their engine in an attempt to catch some handbrake action as the car drives away. For anyone wondering Archie’s request was granted and he did get to surf today. The swell was small, but clean and there was a fun little wave to catch. Archie was taken across the river to Bantham while I stayed on the Bigbury side not trusting my ability to paddle back. I could see Archie and Jon in the distance, their blue and red rash vests visible as little dots amongst the other Bantham surfers. I pondered a little on my conversation yesterday; how comfortable I was with Archie being a barely visible dot in the distance and how a few years ago I perhaps couldn’t have imagined having enough trust in anyone to have allowed them to paddle him off into the distant blue. The people who do this know who they are, and to them I say thank you. This entry was posted in Autism, Behaviours, Learning Disabilities, Surfing and tagged Autism, Challenging behaviours, Communication, Emotions, Learning Disabilities, meltdowns, surfing by alifeunlimited. Bookmark the permalink. So good to see your kids develop these independent, trust based relationships. Incredible program! So inspired!